Nigeria is turning to farming as dwindling oil income has driven the economy to the brink of its first full-year contraction in more than two decades and more people go hungry. The government plans to capitalize the state-owned Bank of Agriculture Ltd. with 1 trillion naira ($3.2 billion) so it can lend to farming projects at less than half the commercial rate. It’s also working with the African Development Bank and World Bank to set up staple crop-processing zones with the electricity and roads needed to attract more private-sector money. The West African nation, which grew almost all the food it consumed and topped global palm-oil and ground-nut production in the 1960s, ignored farming when petrodollars started flowing, leaving it dependent on crude for 90 percent of export earnings and the bulk of government revenue. The nation spent more than 1 trillion naira importing food last year, according to the statistics bureau’s data on foreign trade, and an income squeeze caused by the fall in crude prices and output is forcing the government to diversify its economy. Poor yields and war disrupting agriculture in the northeast has left 37 percent of children in Nigeria malnourished, Minister of Agriculture and Rural Development Audu Ogbeh said. The country is Africa’s most-populous with 180 million people. “It’s only agriculture that’s going to feed us and employ more of us, not oil,” Ogbeh said in an interview on Dec. 5. Nigeria is sub-Saharan Africa’s biggest importer of wheat, sugar and rice, according to the U.S. Department of Agriculture. Other food imports range from fruit to tomato paste. Farming in Nigeria, which consists mostly of crops such as cocoa, of which it is the world’s fourth-largest producer, cassava, rice and palm oil, makes up about a quarter of the economy, and employs 70 percent of the working population, according to the World Bank. 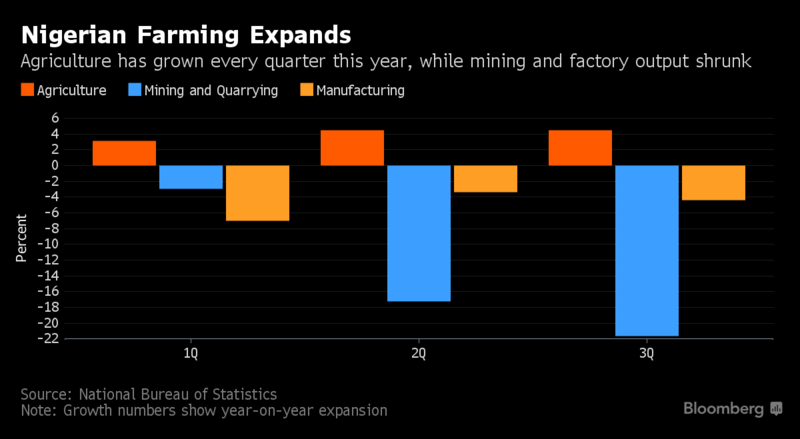 The industry expanded in the first nine months of 2016, while factory output and mining, which includes oil, shrank. Gross domestic product will probably contract 1.7 percent this year, according to the International Monetary Fund. The government aims to use its farming campaign to kill two birds with one stone — achieve self-sufficiency for most consumed foods and boost its foreign-currency position by reducing imports and exporting surplus farm produce. 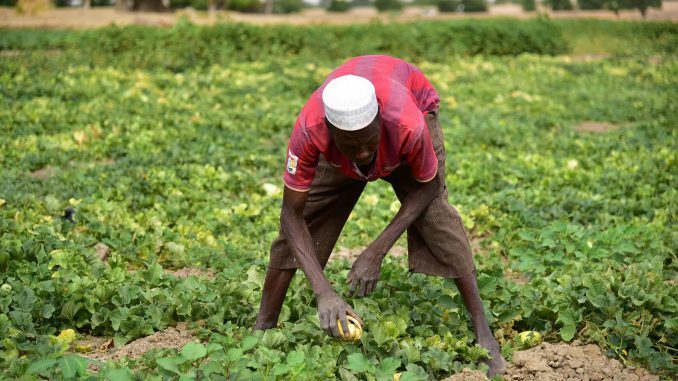 Nigeria’s farming is “on the move,” partly because of the continuity of government policy from the previous administration, according to Lagos-based investment bank FBNQuest. “A total of 14 million farmers were registered on the ministry’s database for access to inputs in February, and a target of 30 million has been set,” it said in an e-mailed note. The processing zones the government is setting up with the AfDB will help to reduce the cost of doing business for food-manufacturing companies, the Abidjan-based lender’s president, Akinwumi Adesina, said in an interview on Dec. 5. Palm-oil companies including Presco Plc, PZ Wilmar and Real Plantation Ltd. as well as as rice producers such as Dangote Industries Ltd. and Alluvial Group are expanding to plug supply deficits even as dire infrastructure could make it tough to meaningfully boost output. The government will distribute 110 subsidized rice mills with a capacity of between 30,000 and 60,000 metric tons each, according to Ogbeh. This comes in addition to a Central Bank of Nigeria-backed deal of loans in the rice-growing northwestern states of Kebbi and Zamfara to supply millers in Lagos, the nation’s commercial hub, that could help cut imports of the cereal by about 10 percent this year, Ogbeh said. Nigeria consumes about 5.2 million tons of rice per year, of which 2.1 million tons is imported, according to data from the USDA.